Last week, I replied to a question from a friend about why I write on Church Set Free. His response back to me was I had written a doxology. I think it may be more of my own private creed. So, in order to make myself a little better known to you, I decided to reveal my creed. Because it’s why I write both here, and on Church Set Free. Other than the Nicene Creed, I believe God is love. I believe God loves you, whoever you are. Wherever you are. Whatever you are. I believe you don’t have to be free from sin or perfect or even close to it to have an intimate relationship with Him. I believe He holds His arms out in a waiting embrace for you. I believe once you come to Him, He’ll never abandon you. He came with love and grace to set you free from chains of shame and guilt. I believe that’s the message of His Gospel. I believe spending time along with God daily brings me closer to Him. It’s a relationship I want to not only maintain, but do my all to grow and flourish. I believe prayer works, even the smallest of prayers, because He is always listening. He might not answer right now, or the way I think they should be answered, but sometimes He does. I believe I am only one of His body of believers gathered together to declare His Message of love to whoever will listen. As a follower and disciple of Jesus, as a member of the online church called Church Set Free, this disparate body of believers, I desire to spread the Message of Jesus – his Good News – so everyone knows Jesus was not just about being a substitution for our sin – He is so much more than that. Jesus welcomes you into God’s family and gives you a permanent and forever home alive and abounding with everlasting love, grace and mercy. His Spirit dwells inside your heart. This heart-to-heart connection is one I live, write about, and want you to have, too. Is it all fun and roses? Absolutely not. I still have hardship. I have doubts and questions. I write about those, too, and how to reckon with them with the help of the God I have come to know and love. Because I believe I have been set free by that love. And I want you to be, too. That should cover it Susan. No doubt there, you got a Love relationship with Jesus. You have a precious heart. Aw, thanks, Tom. Sometimes He really does bring tears to my eyes. Ooh I know. Jesus is so good and loving. We just finished talking to him. I live His sweet presence. Headed to Sunday school. See you later tater! Somehow this escaped my inbox. I have to pay more attention. This is very thoughtful and helpful, Susan. 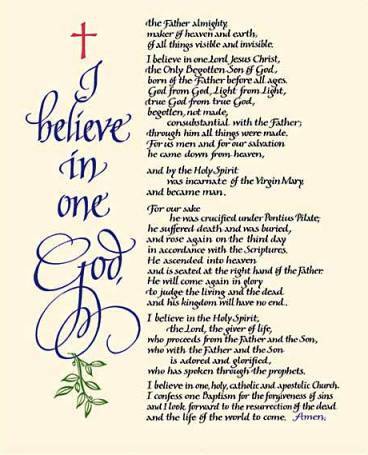 I have always loved the Nicene Creed and of course as a Roman Catholic, memorized it when I was a child. It helps to be reminded of all this. Your creed is one to live by. I could use it as my own! Thank you for the reminder. We all need it because this is a difficult world much of the time and without this Rock, we would drift and despair. Absolutely, Beth. It was an interesting process, declaring my own “doxology.” I think it’s what differentiates me from avowing a particular denomination, and definitely separates me from fundamentalism. I felt empowered making the statement, and you’re right, it’s all based upon the Rock – those red letter words. You’re welcome, Lorrie. I was happy to have the opportunity to answer that question. Never really looked at it before. Definitely prompted by the Spirit! Thank you, v. Never really took the time to write it down before. Glad I did. Thank you, Cate.Kind of nice to be able to define it. Beautiful Susan. Thoughtful, hopeful, and gospel affirming. Adding my Amen! Thanks, Mel. I have a feeling much of it coincides with yours. Blessings to you, too. Haven’t begun reading your book yet. I’m saving it for the Thanksgiving holiday with my family of unbelievers. Plan to settle in at night with some peaceful reading. Great post, Sis and I see why others would call it a “doxology” but I love the simpler, “Statement of Faith!” It’s a great comment on what motivates you to write as you do! God bless, Sis! Thank you, Roland. Again, thank you for adding your comment and glad you’re back!